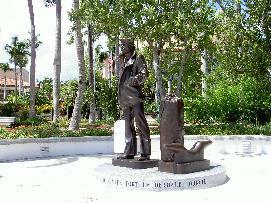 The Navy League of the United States - Fort Lauderdale Council is raising funds to donate the patriotic Lone Sailor Statue to South Florida to express appreciation to the men and women across the globe in the Navy, Marine Corps, Coast Guard and U.S.-Flag Merchant Marine, who voluntarily put their lives in harms way to protect freedom. The statue is meant to inspire youth and honor sea service men and women and their families... past... present... and future. The Navy League of the United States - Fort Lauderdale Council is recognized by the Internal Revenue Service as a non-profit 501(c)(3) organization.